Mobile Shred Truck — We Come To You! Since 2006, Shred Wise has provided its secure paper shredding services to thousands of residential clients throughout Orange County. These clients typically drop off their sensitive documents to us at our centrally located facility in Orange or have us bring our mobile shred truck to their homes to destroy their documents while they watch. By working with us, many of them have found that onsite shredding is not only more convenient and secure than doing it themselves, but also surprisingly cost effective. In fact, once you have more than seven or eight boxes of paper to shred, it is cheaper to have us come to you than for you to go out to a shredding facility. If you request mobile shredding service at your place of residence, we will set up a window of time on a specific day that works with your schedule. One of our carefully screened employees will arrive in uniform within the promised time frame, driving our branded, state-of-the-art shred truck. Our mobile shred truck can drive on most residential streets as long as they have enough overhead clearance. We roll our security bins right up to your paper and place it into our bins. Then the bins are rolled out to the truck for shredding. We can also help transport your documents and files from your home, garage, or storage unit. There is no need to remove paper clips, staples, or rubber bands, and you are welcome to coordinate this service with next door neighbors to reach our minimum and enjoy maximum cost effectiveness. Since we shred your papers on site, you are invited to witness the shredding process from the curb or the truck’s on-board shred cam. Once the paper is shredded, it will be mixed with hundreds of pounds of other shredded paper held inside the truck for further dilution. Then, we will arrange to have 100% of your shredded paper recycled, and issue you a Certificate of Destruction for your records. 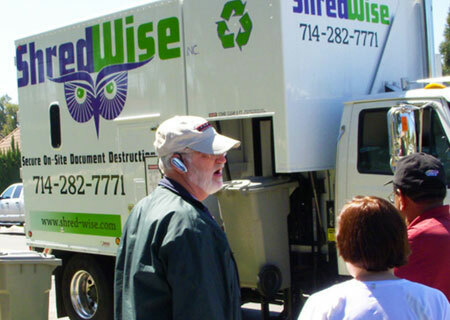 Call family-owned and -operated Shred Wise Inc. today to learn more about our residential shredding services in Orange County. You’ll always reach one of our experienced and knowledgeable team members who will be able to give you prices over the phone, provide you with free advice for protecting you and your family from identity theft, and recommend the shredding service that would be best for your needs. Shred Wise is licensed and insured, and follows the industry’s best practices set forth by NAID, the international trade association trusted by those in our industry to set the bar for secure shredding practices. Our drop off location is available at 3222 E. Chapman Ave. in Orange, from 7am to 5:30pm Monday through Saturday, and 8am to 12pm on Sundays. On-site mobile shredding can be scheduled Monday through Friday. Call today for more tips on protecting your data and ensuring that you don’t become a victim of identity theft.